Consumers will have a new affordable, unrestricted and hassle-free way to buy an iPhone 5 when T-Mobile USA, Inc. begins offering the revolutionary phone on Friday, April 12. T-Mobile announced today that qualifying customers can get an iPhone 5 for $99.99 down, plus monthly payments. T-Mobile is the only major U.S. wireless company to offer iPhone 5 with no annual service contract plus unlimited talk, text and Web on a screaming-fast nationwide 4G network. And because there are no annual contracts, customers make the decision when to upgrade their devices — not the carrier. iPhone 5 is the thinnest and lightest iPhone ever, completely redesigned to feature a stunning 4-inch Retina display, an Apple-designed A6 chip for blazing fast performance and ultrafast wireless technology1 — all while delivering even better battery life.2 iPhone 5 comes with iOS 6, the world’s most advanced mobile operating system with over 200 new features, including Shared Photo Streams, Facebook integration, all-new Maps app and Passbook organization, and even more Siri features and languages. With compatibility on T-Mobile’s 4G network, iPhone 5 customers will enjoy a consistently outstanding wireless experience, seamlessly connecting to both T-Mobile’s existing nationwide 4G and growing 4G LTE networks. Today, the company launched 4G LTE service in seven major metropolitan areas, including Baltimore; Houston; Kansas City; Las Vegas; Phoenix; San Jose, Calif.; and Washington, D.C. T-Mobile’s 4G LTE network is expected to reach 100 million people by mid-year and 200 million nationwide by the end of 2013. The company’s 4G HSPA+ network reaches 225 million people in 229 metropolitan areas. In addition to a great 4G network experience, T-Mobile offers iPhone 5 customers one of the simplest and most competitive consumer rate plans in the industry. 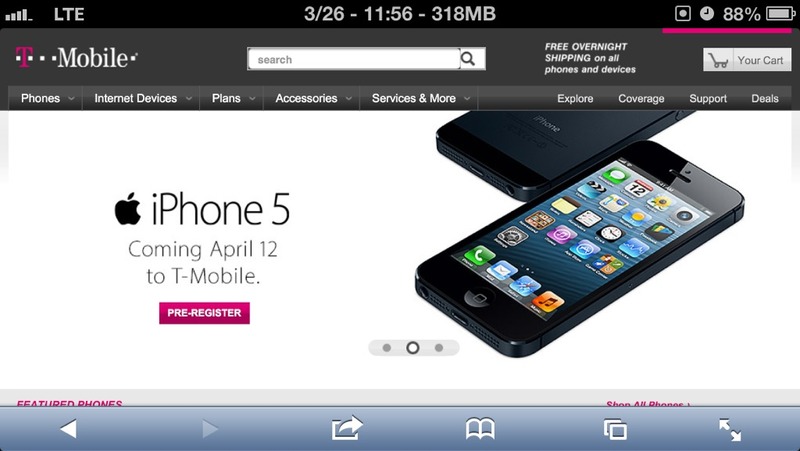 Rather than providing a dizzying number of consumer rate plans, T-Mobile is offering iPhone 5 with just one. T-Mobile’s new Simple Choice Plan starts with a base rate of $50 per month for unlimited talk, text and Web with 500MB of 4G data.3 Consumers can add 2GB of 4G data for $10 per month per line or get unlimited 4G data for an additional $20 per month per line. Customers can add a second phone line for $30 per month, and each additional line is just $10 per month. There are no caps and no overages. HD Voice - delivering nationwide crystal-clear high-definition calling and significantly reduced background noise. T-Mobile is the only U.S. carrier offering nationwide HD Voice for iPhone 5. T-Mobile Smartphone Mobile HotSpot for on-the-go tethering Internet access. Through Simple Choice, T-Mobile offers an additional 500MB of 4G data for tethering, enabling customers to tether from their iPads, Macs and other devices. Talk and surf at the same time — without limits. Through T-Mobile's Simple Choice Plan, customers can opt for totally unlimited 4G data on a nationwide network, something no other major U.S. wireless company offers for iPhone 5.
iPhone 5 will be available for qualifying customers with T-Mobile’s Simple Choice Plan for $99.99 down and $20 per month for 24 months. Qualifying customers can get iPhone 4S through the Simple Choice Plan for $69.99 down and $20 per month for 24 months. iPhone 4 will be available for qualifying customers through the Simple Choice Plan for $14.99 down and $15 per month for 24 months. Financing is available on approval of credit online and in participating locations. iPhone 4S and iPhone 4 will be available in select markets. iPhone 5 will be available nationwide on Friday, April 12, at T-Mobile retail stores and through select dealers and national retail stores, as well as online at http://www.T-Mobile.com. Customers can pre-order iPhone 5 beginning Friday, April 5. For more information, visit the pre-registration page. 1 Network speeds are dependent on carrier networks, check with your carrier for details. 2 Battery life depends on device settings, usage and other factors. Actual results vary. 3 4G network connection required for 4G speeds; all data use applies to allotment. Once rate plan allotment of high-speed data has been consumed, customers will experience reduced Web speeds without overage charges for the remainder of the billing cycle. Unlimited 4G data is available for an additional $20 per month.